Discussion in 'Gaming Reviews' started by MilkyMalky, Nov 15, 2011. How long should you play a game before you can write a fair review on it? 5 hours? 10? Play it enough to see the majority of the game? Or maybe there’s some amongst you who feel you should play a game in its entirety before you can do it justice and fairly critique it? Now I appreciate that’s a lot of questions for the start of the review, but with good reason. I’ve been umming and aahing over this review for a little while. You see I fall into the latter camps that you should have seen the majority of the game in order to fully review it – just in case. It means people are more likely to trust what you say and also gives you all the information you need to form a fair opinion. 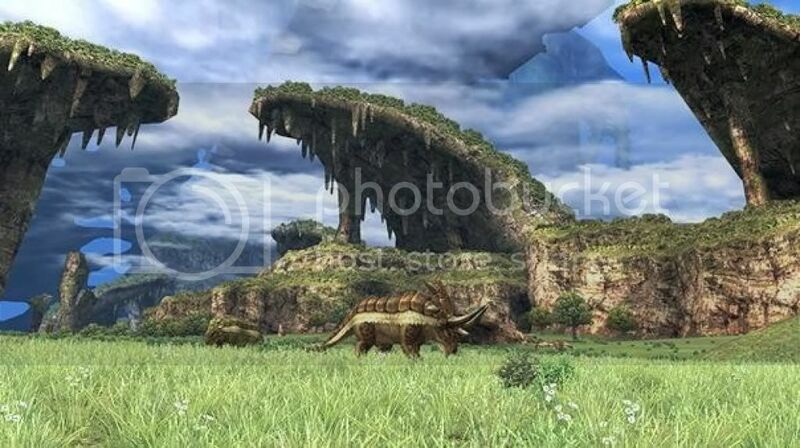 However for Xenoblade Chronicles, and for me personally, that just isn’t possible. To say this game is huge is an understatement. I’m over 30 hours in to the game and a brief look at a gamefaqs walkthrough I would say I’m about halfway through. And thats with me not doing all the side material available here. So I apologise from the start. I haven’t seen the final boss (if there is one) I probably haven’t met some of the more important characters, I’ve probably not seen the big twist, and I still can’t tell you where the story is going to end up. But with 30 hours+ under my belt I think I can have a fair stab at this review to give you an idea of the game and if it is for you. If you’ve made it this far into the review you’re probably thinking “Bloody hell Milky, you can talk for England without saying anything – get on with it!!”. So, for those people I shall summarise my thoughts on this game early on. It’s the best RPG game I have played since the SNES (FYI Secret of Mana), the visuals of the game are better than Super Mario Galaxy (1&2), the soundtrack is better than Twilight Princess, the character development and story are on a par with Tales of Symphonia (the original), so much so that this is the only game I have ever played where my girlfriend actively encourages me to play so she can see where the story is going. To be blunt if you own a Wii still and you like RPGs even remotely, this game needs to be in your collection, and if you still don’t believe me. I will quantify it with the following statement. For my money this is the best game on Wii. Now for those who don’t know me, I’m a die-hard Nintendo fan, I love their creativity and franchises. I live for the next Zelda, Mario or Metroid. My favourite Wii game up until now was Super Mario Galaxy 2, Metroid Prime for GC and Ocarina of Time for N64 – Nintendo franchises all the way. It takes a lot to shift these behemoths and I don’t do it lightly. So hopefully that puts some perspective into that previous statement. The game is that good. Get it now. Hopefully the above will have satisified the “short review” crowd, if you’re sticking with me, you probably want to know my reasons for such an outrageous statement above. So, a bit of background to the game itself. 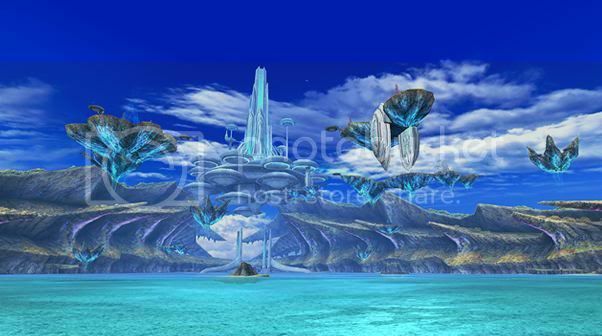 The game world is such that the world is in fact two giant beings known as the Mechonis and the Bionis. These great deities battled long ago, and then after the long fight were both defeated. These deities then provide the landscape on which all life lives. The main protagonist is a guy named Shulk who is a member of the Homs (human) race who live in a colony on Bionis. All seems hunky dory until the Mechon (a robot race) from the Mechonis attack the colony. Shulk then seeks revenge on the Mechon who attacked the people of his colony and along with companions and the mysterious sword – the Monado – he sets off on his adventures. So nowt groundbreaking with the start of the story, its fairly standard JRPG fare of “idyllic life disrupted by enemy”. One of the things that sets this game apart though is the main power of Shulk’s Monado sword, in that it has the power to see into future in the form of visions. These have two functions in the game. The first and obvious one is that it gives us glimpses into the future of the story before they happen – raising the intrigue and leaving the player guessing as to how these things transpire. They are always done to give enough away to make you think but never enough for you to know what is going to happen in the story next. 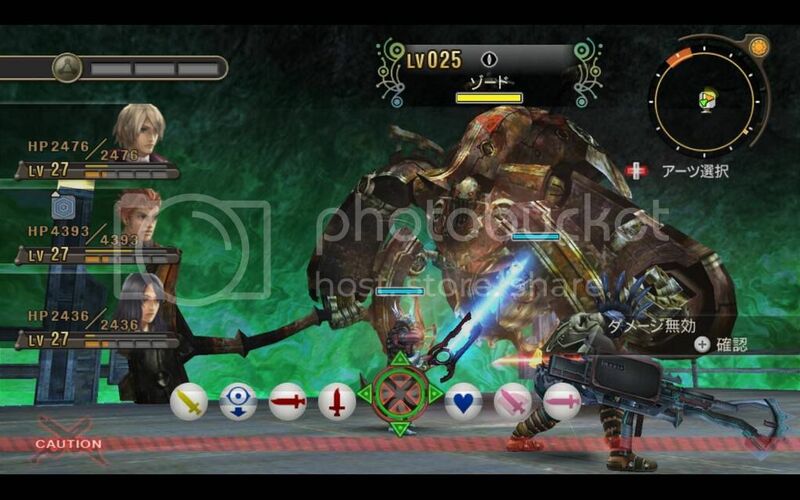 The second is that visions appear during gameplay combat. The combat in the game works that you approach enemies wandering around the game map and you can choose to fight them or not. If you initiate a battle or an enemy wants to fight you, the combat phase starts. If you do nothing and your character is close enough, they will auto-attack the enemy, but each character also has special attacks or Arts that they can use, which each have a wide variety of effects and uses from healing to attacks that deal more damage from behind or at the side of an enemy, although each Art has a certain cooldown time before they can be used again. During combat, the power of the Monado will warn you of particularly dangerous attacks that will happen 8-12 seconds in the future, giving you a fixed amount of time to take action. If you do enough to put off the enemy before the attack you could change the future and prevent the enemy from carrying out the attack. It is a particularly useful tool, and adds an additional skill element to the combat on offer. In addition to the combat, there is a lot of depth to this game. As with most JRPGs, we have the standard levelling up, stats levels of various characteristics (Defence, Strength etc), and equipment to buy and find along the way to help with these stats. But that just scratches the surface. This game introduces an additional core element to the game called Affinity. This is essentially how well the characters in the game get on with each other. Whilst whether or not characters like each other doesn’t affect the actual story as such (like say in Tales of Symphonia) it is a key ingredient that affects so much else. It affects (amongst other things) how well characters fight together, your ability to create valuable items together, the viewing of additional cutscenes between characters, even sharings skills and abilities between characters. Affinity between the party and NPC characters even affects your ability to trade items for rare items. And Affinity itself can be affected by fighting together, exchanging gifts, viewing special cutscenes and a whole host of other interactions. Couple this with a game that has 480 sidequests, a lengthy story, a collectibles challenge, more items than you can shake a Monado at, and you start to see why this review has taken so long to complete. Phew! But what makes this game really refreshing is that at no point in throughout playing this game, have I ever felt that my time is being wasted. A lot of the quests are optional – if you’re a story-only type of gamer for example you’ll be fine, but it certainly caters for the completionist in us as well if you feel the need to try and do everything (just book at a month from work). From a sound perspective, the music in this game is also of a high standard. The wide variety of music for the various different areas you will traverse (and different tunes for daytime or nighttime) is all very well finished and fits the area well. The character voicing is (for once) not a cringeworthy line up of Amercian actors, but some decent voice acting with a good variety of sound bytes during combat etc. However with the sheer amount of fighting to be done, you’ll be hearing the same things alot – but to be honest this is the same with any RPG, FIFA or equivalent game whether similar things happen over and over. So overall, for me this title hit me a little by surprise. A genuine gem of a game from Monolith Soft. A must for any RPG fans, and really a must for anyone with a remote interest in them, because this game is well worth its price, for the time you’ll invest in it alone. But where it really rewards you is with its engrossing story, great visuals, addictive gameplay and plethora of additional extras and depth far beyond most in the genre. So to reiterate for me, this is the best game on Wii currently. It's nice to know there are still a few decent Wii games about and that publishers are giving up just yet. Even though I still own a Wii, I doubt I'll be getting it, mainly because I've just got Skyrim to please my RPG needs, but if it wasn't for that I may of considered it. On it like cheese on pizza! Great review Milky. I've been very very tempted by this but I know I won;t put it down 'til I finish it ! I'm very excited at the prospect of owning Xenoblade chronicles X for the Wii U and even more so at the news of a 3DS version. Made me do quite a bit of research on the original Wii game and I came to the conclusion that I missed what would have been a perfect game for me. Why did I never see this game in my collection? Maybe I was having too many kids at the time. I've looked at getting it 2nd hand and it still fetches £35?!?!? Sign of a good game. I remember Josh paying near that a while back and I looked at the game, it does look very good. I did try & get the Argos controller + game bundle a while back which appeared on HUKD, unfortunately as is typical with people on HUKD, the stock was quickly grabbed for ebay. Well the New 3DS version is going to be a port of the Wii game. That extra processing power (now quad core as opposed to dual core) makes the 3DS a handheld Wii. Could open up quite a few very decent games. Sunshine Mario anyone? I'll be getting the Xenoblade Wii U version, need something that gives me a way back into the RPGBEEGIES format or what ever its called . I fail to understand why they didn't press more copies of Xenoblade on the Wii, it makes you smile when publishers say "oh we didn't sell enough copies of X" and customers saying "why can't I find a copy of Y (at a reasonable price)".